It is only natural to want to get through your annual OB/GYN appointment as quickly as possible. Let’s face it — even the most uneventful visit has an awkward and uncomfortable twinge. Before you slip out of your next appointment, make sure you cover the following topics with your doctor to ensure you are getting the most out of your visit and that you’re taking good care of your health. There are a few key health topics that you should review with your doctor — even if you think you already know the answer. Chances are, you do. However, take a few moments to check in with your OB/GYN to find out when you need a mammogram and to go over the finer points of a breast self exam. The National Cancer Institute recommends that women in their 40s and older should get a mammogram every one to two years. However, your doctor may recommend a different timeline, depending on your family history. Also, it’s good to find out if your period is normal. This is determined by discussing the length of your cycle, the heaviness of your period, cramps and other symptoms. Find out if you should be vaccinated against HPV. According to the Centers for Disease Control and Prevention, HPV is a common and easily spread virus that is the main cause of cervical cancer in women, which causes roughly 4,000 deaths per year. However, the HPV vaccine is not approved for use in people over the age of 26. During your appointment you should also talk to your doctor about screening, symptoms and the prevention of sexually transmitted diseases. If you think there’s even a miniscule chance that you might be pregnant, it’s important to let your doctor know right away. If you’re thinking about having a child, it is just as important to talk to your doctor. Your OB/GYN will recommend dietary changes, vitamins and regular exercises that may help you to conceive. Your doctor will likely have blood work done to test for diabetes, hepatitis, syphilis and possibly HIV. You can also begin to discuss a birth plan. 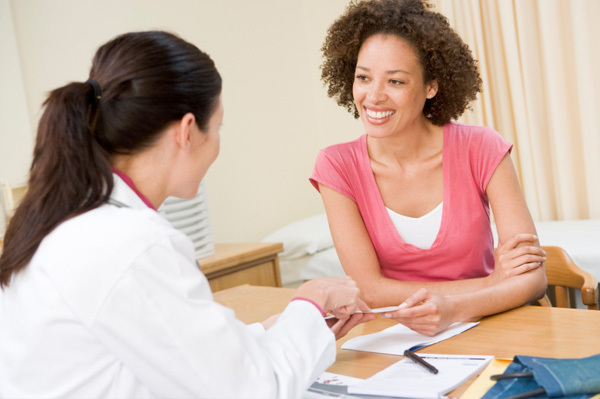 If you’re not planning on having a baby anytime soon, then it’s a good idea to discuss your birth control options with your doctor. Even if you’re already on the pill or are using another form of birth control, take time to review all of the options with your doctor. It’s likely the options (and possibly your relationship status) have changed since your last visit, and you may find there is a birth control plan that could work better for your lifestyle. Before you go to your appointment, take time to write out a list of questions or concerns that have been on your mind. Don’t be shy, and don’t wait until something becomes an obvious problem. Chances are that your doctor has heard questions you can’t even imagine, so don’t feel embarrassed to bring up any topic. Your OB/GYN wants to make sure you are in good shape and good spirits, and she will do whatever possible to guide you down a path to better health, no matter your stage of life.